The best sign for the continued viability of a band that has moved beyond its initial “buzz” is their ability to write quality material and mature in their live act. Real Estate has accomplished both and proved it as the headliner of the Woodist showcase at the Northside Festival. The band continues to play tighter and more focused sets. On Friday, Real Estate opened with a new-ish song “All Out of Tune”, and played two other new numbers, including perhaps the strongest song of the set — an untitled number (“Nothing to Lose”? — sampled as Track 09 below) that premiered at Monster Island in April and for which we mixed the audio of this video of that performance. The song’s guitar line recalls “Fake Blues” but with a stronger melody and representative Real Estate style lyrics — perhaps a perfect new single for the band. 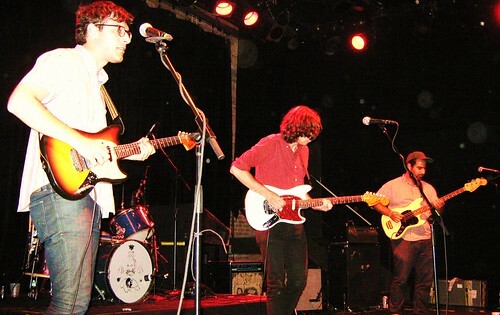 Real Estate perform again in NYC on July 9 at Le Poisson Rouge, at the outset of their extensive tour with Kurt Vile. They return again to NYC in mid-August to open for Deerhunter at Pier 54. I recorded this set with the four microphone rig from the left front corner of the soundboard. The house mix was quite excellent and the sound quality of this recording is outstanding. Enjoy! If you email nyctaper for access to this recording, we expect that you will PLEASE SUPPORT Real Estate, visit their MySpace page, and purchase their releases from Woodist Records, Half Machine Records, and Underwater Peoples (currently sold out). We now know that track 9 is Reservoir #3 (found on the Out of Tune single) and track 11 is Art Vandelay (found on the Ducktails album Ducktails III: Arcade Dynamics). Thanks again for another excellent recording!